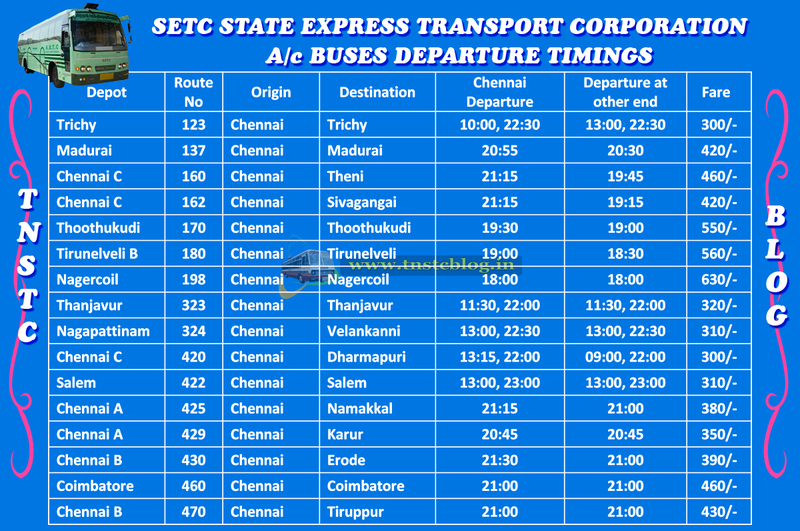 Timings of SETC AC Buses currently running in TN, It includes the latest addition Theni Sivagangai route also. We will update soon if Ac Buses are added to other destination also. Yesterday I saw a new setc AC bus with stickers in front ,back as chennai -Rameshwaram near chennai central station Is there any new busesservices started? yes every district head quarters and important destination is getting ac service which will replace the old buses running in that route. whether all old a/c buses got replaced?I am planning for one trip. please let me know. It was 21:30 ac service from cmbt, pickup at perungalathur by 22:20(actual pickup on that day was by 23:45). And reached Madurai next day morning by 07:25. How to upload the clicks I have? Send us to tnstcblog@gmail.com we will upload it with proper credits. also can you tell me how to book the conductor seat ? is there any chance to do it online? Please let me know the timings of AC bus from trichy to Chennai!! is there any AC bus available at 8 a,m at koyambedu to hosur on 27th november? Is there any Ultra Deluxe or AC bus available from Namakkal to Chennai? what are the pickup points at trichy to chennai ? the bus starts from central bus stand ? I need a bus from Chennai to Coimbatore on 24.12.2017 ar 12AM is it available.